One thing I am learning about my own painting style is that I enjoy the watercolour technique. 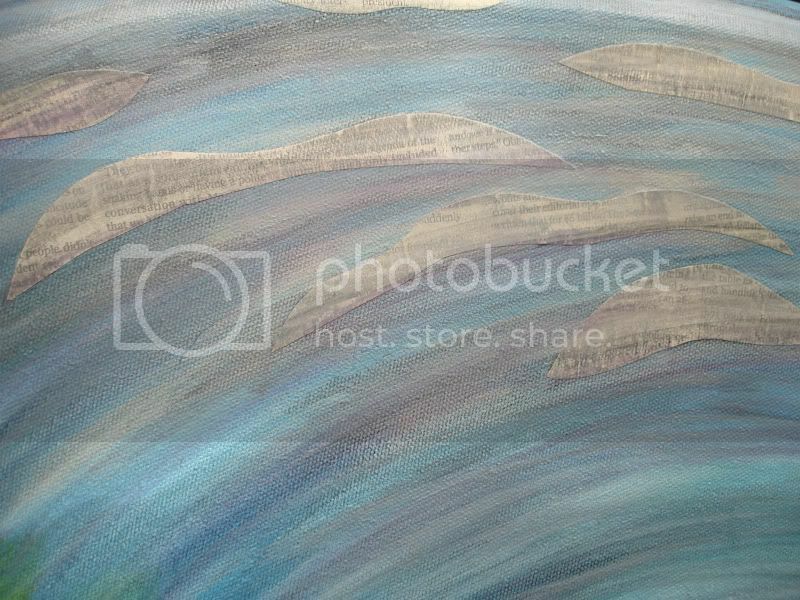 I like to mix paint with quite a bit of water and do a series of washes over the canvas in several different colours until I achieve the desired look. 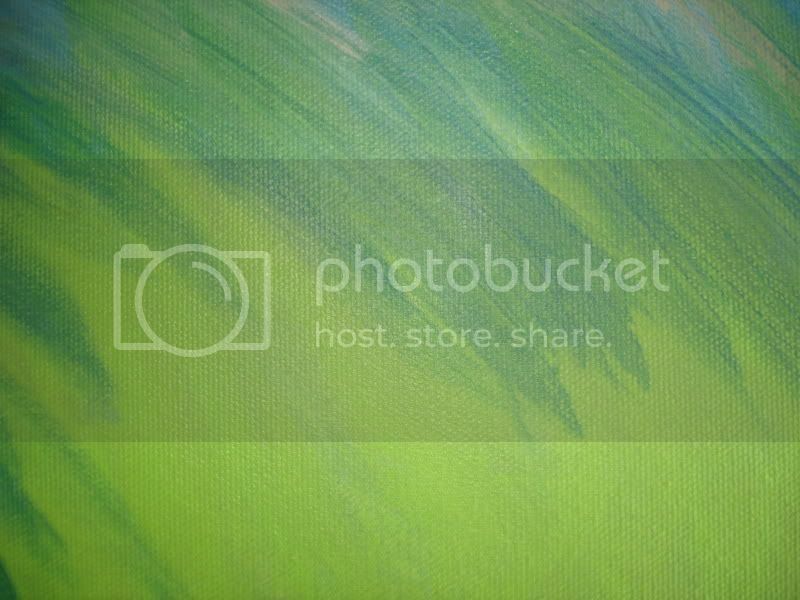 Last night, I began with a bright green and painted most of the canvas like this. Also mentioned in Soraya’s book is how to create texture by adding simple collage. I have been incorporating collage in my work for awhile now. 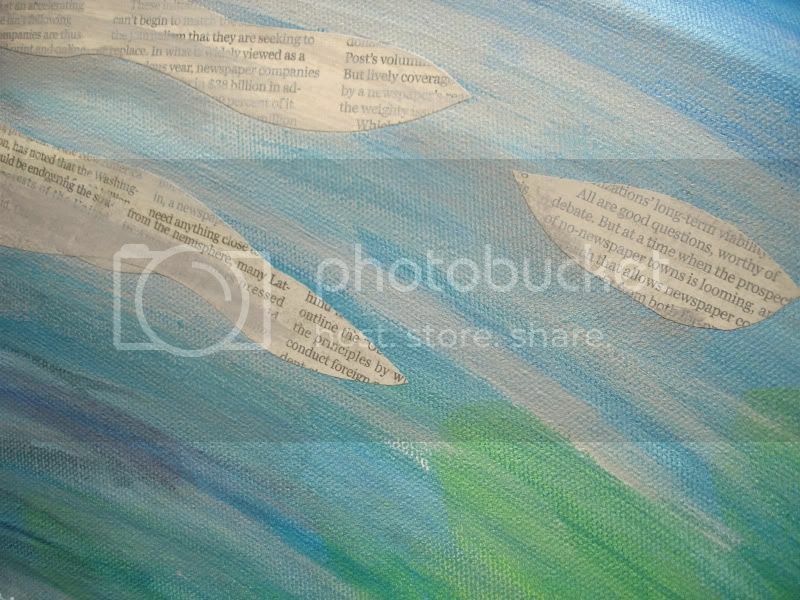 For my beaded White House painting, I cut out several newspaper clouds from a Boston Globe and added them to the canvas using an acrylic matte medium. Once the clouds were dry, I painted colour over them. The newspaper clouds are cut out of several different articles. So far, topics range from the United States’ relations with Cuba to terrorism to the current economic situation. And, to add to the storm, the last cloud on the far right of the canvas mentions that “the prospect of no-newspaper towns is looming“. While Americans look at the White House differently these days, we cannot ignore the issues that seem to have brought on so many months of gray skies. 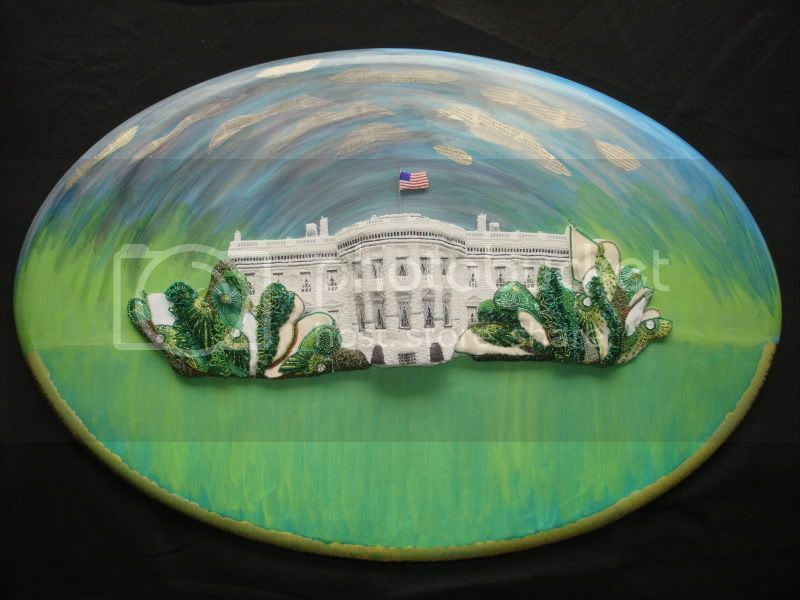 Semi-beaded White House relief painting. 24″ x 36″. Bead embroidery mounted on an oval stretched canvas. Work in progress. >Hi, your work is just amazing! If you would be so kind to stop over at my blog, I hav something for you. Have a great rest of your evening. >really, this is truly amazing ..
>I love love love collaged text — your clouds are awesome. The oval is working out great. >Oh, the layers are so unstatic and the white is so static in its proportions that I love the way this is blossoming. >I love the addition of the newspaper clouds. Things are really coming together. How much more do you need to finish? >Cool paintings. I too, am anxious to see your finished White House! >I love the textured clouds idea! I'm so looking forward to seeing your beaded White House finished!